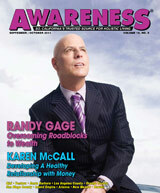 Like many readers of this magazine, I have spent years exploring a multitude of modalities in order to achieve freedom on all levels — including Time & Money Freedom. My greatest desire is to actualize my highest potential for divinely-inspired creative expression and meaningful service in the world. It has been a slow and arduous journey of transformation against a backdrop of a world appearing to be in rapid decline. Given the staggering challenges of our times and the need for all of us to be contributing the very best of ourselves to our most worthwhile endeavors, it seems like this would be a perfect time for a Touch of Grace to help accelerate our evolution into the finest, fullest versions of our Selves. The bacteria have been transformed into different species. Many of the more than 120,000 people Trivedi has blessed over the last 16 years have reported alleviation and even elimination of acute and chronic physical, mental, emotional and even spiritual disorders. “Mr. Trivedi’s body should not be alive according to the laws of medicine and science. The variation from all other human standards is not small. It is a very large variation, beyond belief. Trivedi’s physiological systems and his structure are far beyond that of all other humans; and more importantly, the impact of Mr. Trivedi’s ‘Energy Transmission’ is miraculous.” The Trivedi Effect™ on Personal Prosperity So how might receiving Trivedi’s energy transmissions assist us in our quest to live a richer, fuller, more prosperous life? I had the opportunity to ask him that question in a conversation we shared earlier. Here are some excerpts from his answers. “Happiness is the final goal of everything you do. So, the real question is, ‘What can give you happiness in life?’ And the answer is that you have to follow your life purpose on this planet. And that is more meaningful than money. “Many think they are here simply to survive. Others go to spiritual masters, transformational leaders, and clairvoyants asking ‘What is my life purpose?’ But most of these ‘guides’ are confused and struggling themselves. “You are born with a guide. All the information you need from birth to death is in your internal GPS system. But you have to learn to operate it. And most humans have forgotten how. That’s why they are always stopping at spiritual ‘gas stations’ to get directions from spiritual masters, astrologers, and fortune-tellers — who often give opposite directions. “This energy (that Trivedi transmits) allows people to find their life purpose by connecting the brain with the Spirit — individual consciousness with infinite consciousness — which improves the ability to listen to your inner guidance. Once you have that ability, you don’t need someone else to tell you what you’re here to do. “This unknown energy, which scientists cannot understand, actually penetrates everything and transforms humans at every level — because when you change that energy field you change the character of the individual. It raises consciousness and enables you to bring higher consciousness into every day life. “So it can help a lot in terms of monetary prosperity but also in terms of good health and the healing of emotional trauma and drama. Your knowledge, depth, attractiveness, your competence and ability to be trusted — all are affected by it. “And you don’t need to be receptive to it. No ritual or dog-ma or anything is involved. I call it the ‘independent model’ of happiness because you don’t need anyone or anything outside yourself for direction or real happiness. You have it all inside. This energy helps you access it. That is true prosperity.” The Results People Are Experiencing Blessings can be both subtle and powerful. If you are highly sensitive to energy, you will probably be more immediately aware of what you are receiving from these energy transmissions. And if you have access to medical testing, you may see significant differences before and after you receive a blessing. Until the results of controlled studies with human beings are in, Trivedi makes no claims or promises. You’ll need to rely on your own inner guidance — and the scientific research on the Foundation’s website — to decide whether to experience the Trivedi Effect™ (in person or remotely) in your own life. If you are a healer, you may also wish to explore the Healing Masters program through which Trivedi assists participants to amplify their own blessing powers — in potentially measurable ways. Up until last year, Trivedi provided his energy transmissions free-of-charge and still today takes no money from them for himself. All funds from the not-for-profit Trivedi Foundation are used to finance the research that will pave the way for the Trivedi Effect™ to accelerate advancement of science and elevate conditions worldwide.